A bur is a handpiece attachment that cuts, polishes, or finishes a tooth during the dental procedure. There are three parts to a bur: the head, the neck, and the shank. The head does the actual cutting, polishing, or finishing, while the neck connects the shank to the head. The shank is inserted into the handpiece. The end of the shank will determine which attachment the bur will fit into. 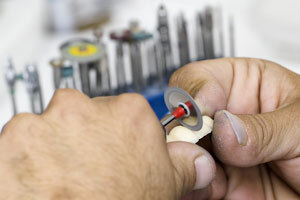 For example, a bur with a long, straight shank will fit into a straight handpiece, while a bur with a latch grip will fit into a slow-speed handpiece. Burs are made of materials like tungsten carbide, diamond, and steel, and come in different shapes, including round, pear, inverted cone, and fissure. Different shapes are used for different applications. Round and pear-shaped burs remove caries, and are used to open teeth for endodontic treatment. Pear-shaped burs are also commonly used to prepare composite restorations. Inverted cone burs are used to establish retention in a tooth for cavity preparation, and also to remove caries. There are several different kinds of fissure burs. Straight fissure burs can be plain cut or crosscut. Both types are used to cut cavity preparation, form the inner walls of cavity preparation, and place retention grooves in the walls of the cavity preparation, but plain cut burs have parallel sides, while crosscut burs have parallel sides with horizontal cutting edges. Tapered fissure burs are often used to form angles in the walls of cavity preparation. They also come plain cut and crosscut. 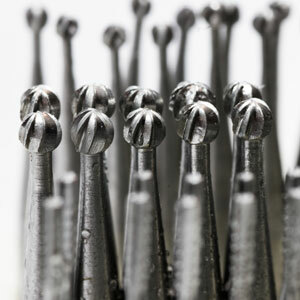 Diamond burs come in many different grips, shapes, and sizes, and are used to prepare a tooth for a crown. Flat-end tapers are used to reduce a tooth, flat-end cylinders are used to reduce a tooth when parallel walls and flat floors are needed, flame shapes are used to reduce a tooth for subgingival margins, and wheels are used on the lingual aspect of anterior teeth and to reduce bulk of incisal edges. Mandrels are used to finish and polish, and come in long shank, short latch-type shank, or friction grip shank varieties. They can be snapped or screwed on to the handpiece. Sandpaper and composite discs are used to smooth and polish restorative material, and come in a range of grits. Rubber points are used for polishing. Polishing grits are colored according to their level of abrasiveness. Acrylic burs and diamond discs are used to cut, contour, and trim models in the laboratory. 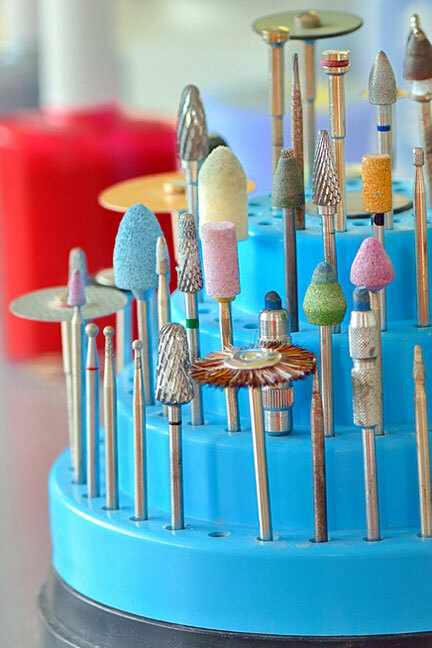 Finishing burs come in many different shapes and sizes; they are used to adjust occlusion, restore tooth anatomy, and finish composite restoration.